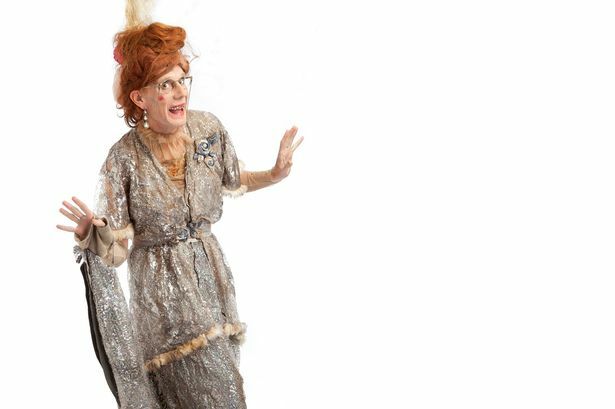 Ida Barr, rapping old time music hall star played by Christopher Green will be at Summer in Southside, the free outdoor arts festival in Birmingham. What do you get if you put together old time music hall songs and modern hip hop? A brilliant mash up, thanks to Ida Barr. The pensioner singer who raps like a teenager is the comic creation of actor Christopher Green. Think of a cousin of Hinge and Brackett, or Dame Edna Everage in a tatty Edwardian dress with an ostrich-feather headdress. Or, in another example, Marie Lloyd meets Missy Elliott. Ida will be appearing at Summer in Southside – three weekends of free outdoor entertainment in and around Birmingham Hippodrome. And for her Mash Up, she will be getting pensioners to sing with youngsters. For example, the OAPs know the old song If You Were The Only Girl In The World, while the teens know Rihanna’s Only Girl (in the World). Chris explains: “I’ve been making several visits up to Birmingham in the last few weeks to work with the elders’ groups and the youth groups. “We’ve been working on five or six songs. Then on the day we will put them together before the performance. Chris is working with up to 100 singers and isn’t daunted by the challenge – he’s done it before with 400 people, in the rain, on the South Bank for the Queen’s Diamond Jubilee celebrations. The aim of his Mash Up is to join together the generations in a real community event. Chris says: “Ida has the ability to engage both young and old and everyone in between who might be passing. They’ll wonder what’s going on and hopefully stay to watch – then join in. “There’s a very thin line between the participants and the audience, as I want everyone singing. People shouldn’t be worried that they will be picked on and humiliated – that’s not what Ida’s all about, she’s very encouraging. “I’m a huge believer in the uplifting power of a communal singsong. “I like getting everyone to sing Jerusalem because we all kind of know it but nobody knows all the words. But it’s a fun singsong, it’s not a flawless performance of Verdi’s Reqiuem. Ida Barr was actually a real person, a music hall star who died nine months before 46-year-old Chris was born. “I was just drawn to her, I didn’t really know what I was doing when I decided to resurrect her. “She was married to another music hall performer called Gus Harris, who is Anita Harris’s uncle. “I happened to bump into Anita at a variety performance and introduced myself. She said ‘You’re Auntie Ida!’. Chris has also created spoof country singer Tina C, of whom Stephen Fry and Sir Ian McKellen are fans. He started out in showbiz as a researcher for controversial Channel 4 late-night show The Word, after a tutor on his drama degree told him he would never get acting work with red hair. The Word became infamous for its ‘I’ll do anything to be on television’ section, in which people ate worms, bathed in maggots, licked sweat off fat people and kissed old people. “It was a pretty extraordinary time and I have to say I did some things I’m not especially proud of,” remembers Chris. “For the first series I was a music researcher, which was cool. Jo Whiley was the music producer, booking bands like Nirvana that I looked after. “Then I was a film researcher doing more of the trashy stuff. I remember having to find a tour bus full of Japanese tourists. I kidnapped them by bribing the tour guide and got them to sit in the studio. “I was also implicated in getting Oliver Reed drunk before he went on as a guest. It was a bit of a stitch-up and I wasn’t happy about it. Chris is returning to the Hippodrome at Christmas to star in The Frozen Scream, which he’s co-written with novelist Sarah Waters. It tells the chilling story of a group of friends stranded in an abandoned lodge in the heart of winter. Offering an alternative to pantomime, the show will be staged in January in the Hippodrome’s studio. Chris says: “I’ve worked in Birmingham a lot and I’m delighted to be returning, especially as I am great friends with Janice Connolly, aka Barbara Nice. * Ida Bar’s Mash Up takes place at the Arcadian on Saturday August 23 at 1pm and 3pm. There&apos;s more fun to be had at Summer in Southside this year, as two weekends turn into three. Every weekend from August 9 is packed full of free outdoor performances around Birmingham Hippodrome. More than 30 companies featuring more than 100 local, national and international artists will transform the city’s Southside district around Hurst Street and the Arcadian. They offer everything from drama and dance to circus and street theatre, from music and hip hop to aerial artistry. Last year’s festival, held over two weekends, drew audiences of more than 12,000. Now it’s even bigger, culminating in a special Bank Holiday Jamboree. Peter Knott, area director of Arts Council England, said: “The programme promises unique and ambitious productions, from Coventry-based Talking Birds theatre company to the internationally acclaimed Wired Aerial Theatre. The Roswells are an alien family who visit planet Earth as a holiday destination and want to discover what humans are like. Look out for the creations of the Coventry-based company as they pop up anywhere on Southside. Close Act Theatre&apos;s iPuppets from the Netherlands will be at Summer in Southside, the free outdoor arts festival in Birmingham. This street theatre company from the Netherlands combines dance, music and circus, as five performers operate giant puppets with large eyes. Visitors to Southside will be serenaded by opera singers as members of Oyster Opera break into song just about anywhere. They combine beautiful singing with having fun and a good dose of audience participation.